Perched on the edge of an ancient Arbutus grove, The Treehouse is a uniquely romantic and memorable place to stay. This spacious upstairs retreat with vaulted ceilings and 360 degree views is a tranquil escape from the ordinary. The Treehouse is a short walk to the beautiful Westin Bear Mountain Golf Resort & Spa and a short drive to the many sights of Victoria. 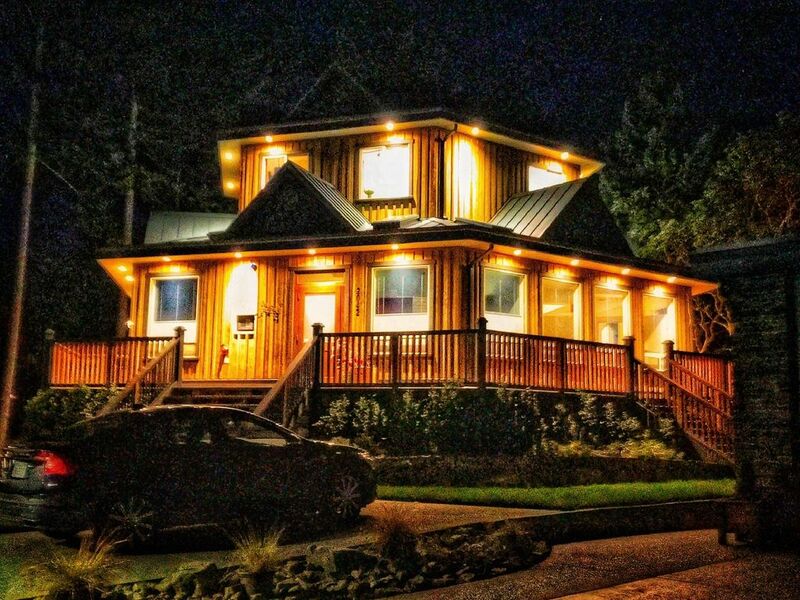 Whether you come for mountain biking/hiking, pristine beaches, a round of world-class golf, or to explore greater Victoria, The Treehouse is your perfect getaway. This fully-furnished 1000' circular loft comprises the top floor of the Treehouse. This stylish, airy space with private entrance, provides a romantic, zen-like experience and offers many amenities including a king size bed with luxury linens and down comforter, a 40" HD TV with Shaw cable and Netflix, high-speed internet, central heating and air-conditioning, private parking, and exquisite hiking trails that start at the side of the house. The suite boasts a modern kitchen with stainless steel fridge, coffeemaker, cappuccino maker, toaster, microwave, Nutri-bullet, wine fridge, dishwasher and much more. Just bring your clothes and a tooth brush! Mark and Kimberly recently moved to beautiful Victoria, BC from Los Angeles. Mark is a TV director, Kimberly a recovering blue chip attorney. We fell in love with the unique beauty and charm of the Treehouse. The location fits us perfectly as we love to hike, kayak, swim and explore the natural beauty that surrounds us here. The house ain't called the Treehouse for nothing! The distinctive architecture of the building sits on the edge of a forested canyon. It's unique. One of the benefits of the Treehouse is an amazing hiking trail that starts 30 feet from our front door! We also love being a five minute walk from the Westin Golf course and spa, the public pool, and the athletic club. expansive bathroom with rain shower head, plush towels and robes. Hair dryer and other bath amenities. The beautiful Bear Mountain Westin Resort and Spa is a short walk from the Treehouse. The Treehouse looks out an Mt. Finleyson and a beautiful forested canyon. Regular drip coffee maker as well as espresso maker. Fully equipped kitchen including, dishwasher, coffee maker, expresso maker, Ninja, toaster, microwave, wine-fridge. Complimentary coffee and tea. Tennis is available at the club, 5 minutes away. There is a world class golf course minutes away. Great place to stay. Well equipped, very clean. Must have transport as it is a long walk down the mountain. A blind on the kitchen window would be advantageous to keep the morning light out for a long lie in! Thanks for visiting us Kathleen - and good suggestion on adding a blind in the kitchen. Will do! Beautiful, modern, warm, and extremely clean home to spend your time in Victoria! Beautiful, modern, warm, and extremely clean home to spend your time in Victoria! Kimberly was extremely attentive and responsive to any questions we had. The treehouse is a wonderful space in a very nice neighborhood. Our stay there was a pleasure for us. Very clean, great size for two, hosts are extremely knowledgeable of the area. We loved our stay there, dog included, very clean, Kimberly and Mark are excellent hosts, know the area well for hikes and restaurants well outside the immediate area. Would love to stay there again. Excellent location, the accomdation was even better then I expected. Great location, very nice suite, would absolutely recommend it to a friend. It is even better then the pictures! The space is extremely well maintained and certainly has everything you need to make it a perfect getaway. From the comfortable chairs and sofa to the well designed kitchen you only need to place down your bags and relax in this nest in the trees. The nearby market gave us the chance to enjoy homemade sandwiches and superb coffee. Highly recommend this space as not only is a great environment but your hosts are very accommodating and friendly. Will return. We are surrounded by natural beauty. Hiking, mountain biking, beautiful beaches. If you like the great outdoors, this is the place. Plus Victoria is just a short drive away.